Are you ready to take the next step and open your own facility or studio location? Be sure that you go in prepared! You’ll want to have a list of all of your requirements when you go to look at office space or meet with a commercial realtor. There is nothing worse than some minor, but CRUCIAL requirement you forgot to mention or didn’t think of ahead of time delaying or prohibiting your acquisition of studio space. It happens! It has happened to us multiple times. Some plans and transactions have been stretched out for 9 months or longer because of these very issues. We’ve even had to move away to neighboring states because the locations we were talking to couldn’t meet our requirements. Things like climate control, location, what floor of the building, rent, security, entry, exit, bathrooms, parking, phone, internet, kitchen, bathrooms, showers, layout, build out, lease stipulations, and especially, ZONING all have to be considered in part and in whole. Any one of those things could be a deal breaker. Don’t waste time on prospective properties that won’t pan out for you in the end. Go in with a plan and be prepared in your search. It will take a long time and it is a difficult process, so don’t make it any longer than it needs to be. Get this simple office/studio space check list for your personal training business and know what you’ll need ahead of time and only pursue those properties that best match your requirements. Many people don’t take the fitness industry seriously for understandable reasons. That kind of attitude can inhibit your ability to rent space from a landlord. You’ll look much more professional to a landlord going in if you’re prepared. Automatic Online Bookkeeping for Personal Trainers for less than $10/month. Taxes, payroll, bookkeeping and accounting. These are definitely a few things that stop people from starting businesses and becoming entrepreneurs. It’s just too difficult and too much to think about. And, if you’re boostrapping, it can be really hard to hire someone to do it. But, this might be one of the best inventions for entrepreneurs ever. And it’s cost effective too. 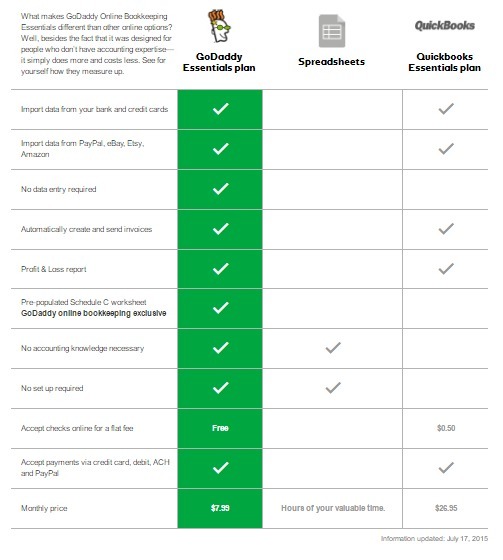 GoDaddy has an automatic bookkeeping service. If you’ve ever used Mint.com for your personal finances, it works in exactly the same way. Here’s what you do. You simply integrate it with your online business banking and connect your other accounts like Paypal or anywhere else that money might flow in and out of your business. Some people are running businesses and not keeping track of any financial transactions. They have no way of knowing where their money is going or what is working. Hopefully, you’re not one of those people. But, even if you are, now there’s no excuse. I like that it is automated. It’s essentially a robot. It doesn’t forget. It will work 24/7. And is always there when you need it. It’s a LOT of control back in your hands, while saving you time, for only a few dollars a month. It’s pretty hard to beat. I have it working in 2 businesses even with people on staff in these financial roles. If you have been going without recording financial transactions, just do it now. You can set it up in minutes and know the health of your business finances almost instantly. This is easily one of the most useful tools and resources I’ve ever come across for entrepreneurs. Seriously, top 3. It’s a no brainer. Take a look at the comparison chart below. This isn’t just another form of quickbooks. It’s automatic. It’s done for you. Once you set up the appropriate categories for your income and expenses, it will learn going forward when those transactions occur to categorize them correctly. It will produce a profit and loss (P&L) report for you immediately at any time. No data entry required. Click to get GoDaddy online bookkeeping! Starting a fitness business should be no different than starting any other business. Many people get into it because they enjoy fitness and working out, themselves. That may or may not be a good reason. But, that’s something you’ll have to explore for yourself. Consider that because it is something you enjoy, that doesn’t mean that it will translate well into the coaching skills you’ll need to convey concepts and deliver programs to other people. Obviously, it helps if you’re passionate about the subject. So even if you don’t have those skills yet, if you have a burning desire to learn and immerse yourself in it, you can acquire them. Before you start, it is always good to ask yourself or really assess yourself for readiness to actually begin in this field. I always like this list of questions from Harvey Mackay. It’s sort of an entrepreneur test. Additionally, there are some industry specific things that you will want to ask yourself too. Are you ok with irregular income especially in the beginning? Is this something you want to do part time or move to full time? Are you ok with working odd hours? Do you feel like you have the energy to bring your A game for every client’s session? Are you ok with not being able to generate income if you are unable to work (sickness, vacation, injury)? Are you ok with managing the business side of things in addition to building your technical skills? Are you ok with dealing with difficult or demanding problems clients may have? It’s quite a challenge to navigate all of that. Some of us may never be ready to handle all of it. Some people are. I’ll be honest, most people I work with never make much of getting into the field. Probably 1% or less. Most times, it’s because their skills are lop sided one way or another. Maybe they are great at delivering programs, but don’t want to market to find new leads or new clients. Maybe they get new leads and clients all the time, but don’t have a good ability to retain them with their technical skills and good relationship skills. If you are ok with all of that and have a high tolerance for such things, you may be a good candidate for starting a fitness business. The next hurdle to overcome is people tend to wait for the right time. No time is perfect. Wasted time is the biggest cost you could ever incur. You should absolutely be organized and have a solid plan, but don’t let fear or the unknown paralyze you either. The barriers to entry into the field are currently low. If you realistically feel like this is right for you, the time for starting a fitness business is now. S.P.A.R.T.A. is here to help with that. I had been discussing with someone the lack of philosophy or direction some trainers seem to have in implementing methods. Or maybe the dominance of trends that seem to come and go and occupy fitness professional’s mindsets. Below, we uncover a hierarchy for determining your specific methods you’ll choose to implement in your business. Not the how, but mostly the why you do what you do. When coming up with your own specific methods, it helps to look at it in this hierarchical process. Thanks to David Crump for writing the article that inspired me to take this a step further. Most of what we have talked about here has been evidence in the way of scientific laws, theories, principles, and we fill in the gaps with philosophy. Laws, theories, and principles will not change much over time. It’s that in between area or gaps in our knowledge where we may have to make some temporary leaps. What you think about these areas is more likely what will change over time. Starting from this base, most of our programming is likely to look the same. Likewise, practicality is a concern. Not everyone is going to have access to the same tools. Yes, free weights are fairly abundant, but not much else is. The tools, the specific exercises, and techniques you choose to employ will differ among trainers. Again, it’s important to avoid ideology here because nothing is perfect. You can’t do everything all the time. The body just isn’t set up that way. There are only trade-offs and best decisions given a variety of conditions at any given time. Why philosophy after principles? That’s because the 3 former points are relatively stable in science. Things like the all or none principle, or the principle of specificity, or the overload principle, are generally well established. We can all nearly agree 100% on those things. Yes, there are still gaps in some of the knowledge because this science is still in its infancy. Modern exercise science has really only been around since the 1920’s or so. Even though more general sciences like anatomy and physiology make it up. Nevertheless, there are some gaps in our complete understanding of the subject. Philosophy can have several definitions. 2. The study of the theoretical basis of a particular branch of knowledge or experience. 3. A theory or attitude held by a person or organization that acts as a guiding principle for behavior. As you can see the last two define philosophy within the context of theory. The first definition describes it as a study of the fundamental nature of knowledge. So, once we know all the laws, theories, and principles that are well established (this is where school and certification should come in), we can continue that line of thinking to fill in our knowledge gaps based on what is most logical or most likely given what we already know. If we continue to apply the same logic that led us to earlier answers, it’s reasonable to expect more than one professional to come to the same conclusions on what we don’t yet know. The next point of tools concerns practicality. We have many tools at our disposal and it’s really a personal preference at this point given a variety of conditions with no one tool really being better than any other. 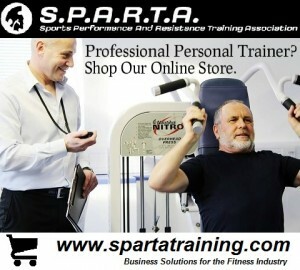 If you don’t have access to the best equipment in the world, you use what you or your client’s have access to. What’s practical. It’s that simple. Exercises, are, of course what you’ll be doing with the tools at your disposal. We generally have a standard group of exercises based on muscle and joint function, biomechanics, and the principles which we already agreed are generally well established. Two professionals with a good knowledge of kinesiology and biomechanics aren’t likely to use very many different exercises. We do have a number of variations of a number of exercises and again, it may more depend on the tools available to you. Techniques are where things are more likely to differ among professionals. Many different styles of work can be performed still within the realm of safety and effectiveness. Some may prefer more standard rep speed cadence, some may prefer a slower speed cadence. Some others still may prefer to use different cadences at different times. These are perfectly acceptable deviations based on what we know to be safe and effective at this time. The same holds true if you and your clients prefer to use things like static holds which are more on the loading end of the spectrum versus slower speed repetitions which emphasize more of the deep fatiguing aspects of training. Or using any combination of techniques in between. All of these items together in whole and in this order will lead you to what will be your specific methods. Again though, it is a hierarchical and ordered way of thinking. You don’t want to make up exercises and techniques with a total disregard for the established principles and laws. That won’t work. It won’t make you look good and it might even get you into trouble. The same will hold true for nutritional approaches or a number of other things in your life, for that matter. Practice thinking in this way critically and it will help you make adjustments and solve problems as they arise. Most of all, it will help you work better with your clients to ultimately, give them what they need and want. Together, if we all agree to start from this base, we can move toward a more standardized industry while still retaining individuality and differentiation.